Making Books is a project that has been developed since 2013 by KTF and SEAM. Remote primary schools are poorly resourced for books of any kind beyond Education Department workbooks for the higher grades. Well-meant donations of books are rarely culturally relevant. 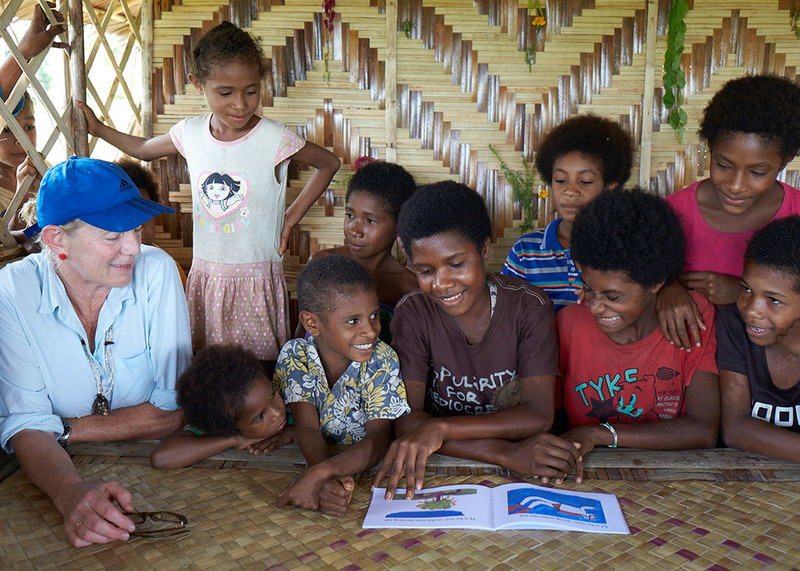 There are few books written for PNG children of any age telling their own stories and written by their own people. This has begun to change over the last five years with changing technologies and the revitalisation of a new generation of PNG writers through initiatives like the Buk bilong Pikinini libraries  and the Crocodile Prize and Anthology . However few, if any, of the books from these small town-based groups reach the remote communities. KTF/SEAM’s experience with book making at the KTF College and at Tainabuna village school have demonstrated the enthusiasm of students and teachers, parents and community leaders. Making their own books, telling their own stories, painting their own pictures has engaged students of all ages in creative learning, as well as teachers who otherwise rely on chalk and board. Community leaders see Making Books as a way to collect and preserve cultural knowledge that has been handed down over generations through oral stories and teaching about cultural life from the making of art and artefacts, to knowledge about plants, the use and maintenance of forest resources, house making, canoe making, gardening, fishing, etc. With the rapid rise of mobile technologies, social media, and the lure of the towns, there is a very real danger of this knowledge becoming under-valued and lost. In remote villages almost all women over 60, and most men, are non-literate. Their minds and their memories are repositories of knowledge and wisdom, to which Making Books can give new shape and purpose. From 2016, Making Books will be incorporated into the training of teachers at the KTF college in both low-tech methods and the use of computer and printer technology. School-in-a-Box will provide teachers returning to remote schools with solar panels to run the computer and printer technology required for Making Books, as well as art materials, paper, equipment etc for low-tech Making Books methods. School-in-a-Box will provide a hub for visiting specialists (such as artists, writers, botanists, ecologists) to work with the community and learn from it. Funding is being sought to run three book-making workshops at KTF College over the next year. These would be of 1-2 week duration, led by the director of training at the college, Petra Arifeae, with a PNG Writer and an Australian writer experienced in the technology. Help children and communities make their own books. tell their own stories and preserve their oral heritage. Target cost for Making Books materials and equipment per School-in-a-Box is $3,000.